The Baltimore Sun reported this week that the RSLC spent nearly six figures on mailers “that oppose more than a dozen Democrats running for the General Assembly.” Republicans are trying to break the supermajority held by Democrats in the state House this cycle as Republican Governor Larry Hogan and Lt. Governor Boyd Rutherford are in a strong position to win re-election. The Hogan-Rutherford administration has some of the highest approval ratings of any gubernatorial administration in the country and Republican legislators are hoping to capitalize on their popularity to grow their caucuses. Republicans need to gain at least six seats in the House of Delegates to break the supermajority. Wisconsin Senate Majority Leader Scott Fitzgerald spoke about his caucus’s electoral prospects at a candidate forum this week saying he’s confident Republicans will remain in the majority following the midterm elections. “I think the Trump voter changed everything two years ago,” Fitzgerald said during the forum, “If they show up in November they will make the difference in this election.” The RSLC has been active in a few of the competitive Senate races Fitzgerald discussed and today they released their first television ad in Wisconsin’s 1st Senate District. The ad focuses on Democrat Senator Caleb Frostman’s support of government-run health care. 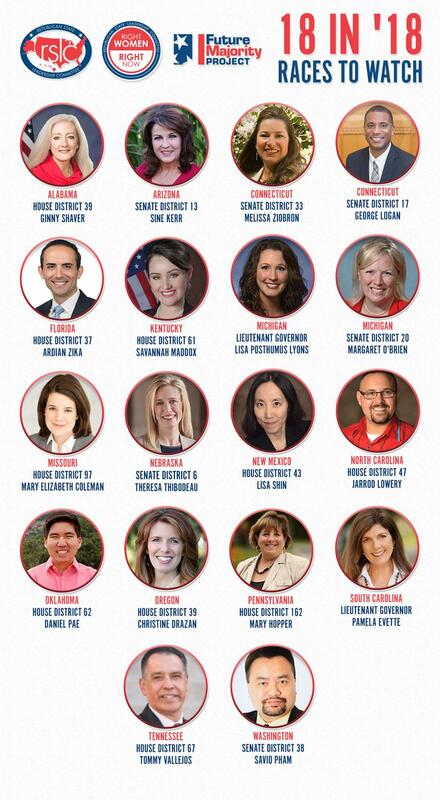 The RSLC released it’s fourth edition of the “18 in ’18: Races to Watch” list featuring candidates from 16 states. This edition includes two candidates for the Connecticut state Senate, state Representative Melissa Ziobron and current Senator George Logan. Republicans are aiming to break the tie in the state Senate in November and the Connecticut Post reported the RSLC last week contributed $400,000 to Change Connecticut PAC which has focused on flipping both chambers of the Connecticut legislature. The RSLC’s Judicial Fairness Initiative launched an ad in support of Arkansas Supreme Court nominee David Sterling which highlights his conservative credentials and service to the state. “As Justice, David Sterling will promote the rule of law, uphold the Constitution as written and protect our communities from dangerous criminals,” RSLC President Matt Walter said upon the ad’s release. He also suggested that Sterling’s opponent, Justice Courtney Goodson, has violated ethics laws as she has appeared in campaign ads in the Supreme Court chamber in her judicial robes.